Vibrio cholerae O1 has figured prominently in the history of infectious diseases as a cause of periodic global epidemics, an affliction of refugees in areas of social strife and as the disease first subjected to modern epidemiological analysis during the classic investigations of John Snow in mid-19th century London . Thus, publication of the entire genome sequence of V. cholerae O1 (biotype El Tor) in Nature  by a consortium of investigators from The Institute for Genomic Research, the University of Maryland and Harvard Medical School is properly regarded as an historic event that will trigger a paradigm shift in the study of this organism. Vibrio cholerae O1 causes Asiatic cholera, a purging diarrheal illness that can kill an adult within 24 hours. Its most intriguing and least understood feature, however, comes from the study of its annual epidemic profile in the Bengal region of Bangladesh and India. There, nearly all cases each year occur in a synchronized, massive outbreak in the months of October and November, just as the monsoon rains decline . During most other months of the year, cholera cases occur sporadically or not at all. This epidemic profile and its correlation with major transitions of climate point to the following: V. cholerae O1 resides in a stable environmental reservoir; then, seasonally determined changes in rainfall and sunlight trigger its periodic and transient emergence as a human pathogen . Between epidemics, V. cholerae O1 lives in natural aquatic habitats formed by the confluence of the Ganges and the Brahmaputra rivers. 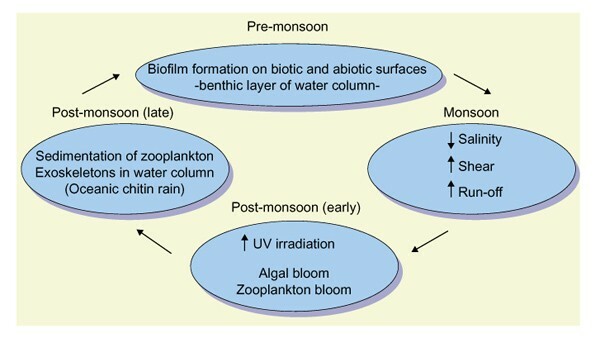 All the physiochemical and ecological features of this system are dramatically influenced by the monsoon climate. Within this ecosystem, five distinctive stages have been proposed to comprise the V. cholerae environmental life cycle: an independent, free-swimming form; a symbiont of phytoplankton ; a commensal of zooplankton ; a viable, but not culturable state ; and a biofilm community attached to abiotic or chitinous surfaces (Figure 1) [8,9,10,11,12]. Thus the functional repertoire of the V. cholerae O1 genome must be unusually broad as it accommodates two, quite distinctive, lifestyles: the milieu of the human intestine and long term residence in aquatic habitats that are subject to climate-determined changes of the microenvironment . The functional annotation of the V. cholerae O1 sequence  sheds light on this remarkable capacity. In particular, the distribution of genes of known function between the large and small chromosomes of the organism provides tantalizing clues about how the two-chromosome configuration of the Vibrionaceae might confer an evolutionary advantage in habitats that vary with climate change. Although the large chromosome (chrI) contains most of the genes that are required for growth and pathogenicity, some of the components of several essential metabolic and regulatory pathways reside on the small chromosome (chrII). Thus, retention of chrII is presumably required for survival of the organism, at least under some conditions of growth. By contrast, a larger percentage of hypothetical genes and genes of unknown function reside on chrII. This asymmetrical distribution of genes suggests that under certain conditions differences in the copy number of chrI and chrII might occur, potentially increasing the effective level of expression of genes on the more numerous chromosome to the organism's advantage . A related hypothesis, which can now be tested, predicts that chrI genes mainly adapt the organism for growth in the intestine whereas chrII genes are essential within environmental niches. The extreme in chromosome copy number asymmetry is the loss of one chromosome and Heidelberg et al. suggest that non-replicating, single chromosomal cells, within a nutrient-stressed population of normal two-chromosomal cells, might contribute to the survival of the community by continuing to secrete enzymes that break down molecules in the surrounding microenvironment. They propose that the resulting nutrients might be used by normal members of a community at risk, thereby promoting survival of the species. The organism's capacity to access nutrients within diverse environmental habitats is also enhanced by the extensive duplication of genes involved in nutrient scavenging. A striking example of this is the apparent duplication of genes coding for chitinase, which together with the corresponding phosphoenolpyruvate phosphotransferase system, produce and transport chitin-derived disaccharides released from the exoskeletons of zooplankton to which V. cholerae attach [2,6]. 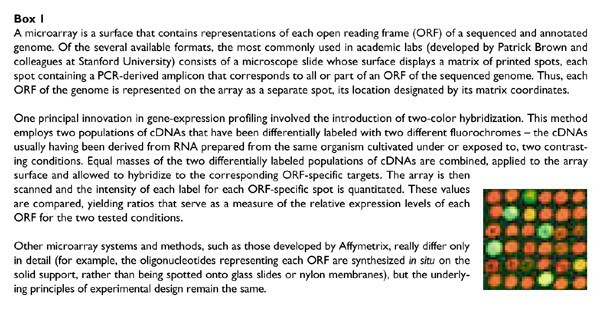 While the identification of genes of known function is an important achievement, it must be remembered that only 54% of the identified open reading frames (ORFs) are predicted to encode proteins of known function  and, even for these, differences in sequence could confer unexpected functions. Thus, although completion of the V. cholerae sequence is an important first step, now it is important to use this information to launch functional genomic studies by mutational approaches, comparative studies of related organisms and expression profiling using DNA microarrays (see Box 1). Bioinformatic analysis of microarray-derived expression profiles will reveal sets of co-regulated genes that mediate the adaptive response of the organism to different conditions of growth [14,15]. Further analysis of co-regulated gene clusters will disclose components of metabolic and biosynthetic pathways . Initially employed for eukaryotic expression analysis, this method has recently been used to study bacterial transcriptional responses as well  and methods to stabilize bacterial RNA have been developed  and modified for this application. To date, most such studies have explored physiological responses, changes during development, and the mode of action of antibiotics. Now, with the identification of the 3,885 ORFs of the V. cholerae O1 genome sequence , fabrication and use of the corresponding DNA microarray will surely follow. What ecological and pathogenic questions might whole-genome expression profiling of V. cholerae O1 address? Investigators will want to learn more about how this species adapts to the many niches it so successfully occupies. To this end, microarray experiments will be conducted to identify genes that are differentially expressed in biofilms formed on plastic, glass and chitin membranes; during co-cultivation with algae and zooplankton; after exposure to different concentrations of saline; and within the human gastrointestinal tract. Because the annotated genome sequence highlights a number of transcription factors , expression profiling will also be used to identify which genes these factors control. For example, the regulatory network governed by rpoS - which encodes an alternative s factor postulated to be required for the environmental survival of V. cholerae O1  - could be dissected by identifying which genes are not expressed by a rpoS mutant when compared to the wild-type parent. Finally, microarray DNA-DNA hybridization experiments will be performed with labeled DNA to compare the genomes of closely related, but non-identical, strains and species . The most compelling study of this kind will seek to identify genes present in the sequenced El Tor biotype of V. cholerae O1, but missing from the yet-to-be-sequenced Classical biotype. The Classical biotype caused the fifth (1881-1896) and sixth (1899-1923) cholera pandemics, but was evicted from most endemic areas by the El Tor biotype during the on-going seventh pandemic . This has led to the idea that the El Tor biotype is somehow more environmentally fit than its close, Classical cousin . Accordingly, within the set of El Tor-specific genes may be those that confer a selective advantage in the estuaries and rivers of South Asia. V. cholerae O1 has become the model organism to study the effect of climate on the evolution, emergence and epidemiology of an infectious agent . The publication of the entire genome sequence of this species, particularly when combined with array-based functional genomics and on-site and remote imaging of the Bengal river delta , will probably provide the first opportunity to study how climate change affects an organism's transcriptional activity. The environmental life cycle of Vibrio cholerae O1.